Are you worried about the thieves and creeps trespassing your yard at night? Worried about high electricity bills that you need to pay for bright lighting in your yard? If you have similar concerns then we are here with a perfect solution for your problem. Amir Solar Powered Motion Sensor Light will put an end to your lighting woes. No more expensive electric lights, no more cumbersome installations, no more replacing batteries every month. Amir solar powered light is a great eco friendly product for outdoor use as it is waterproof and has easily rechargeable battery of 2200 mAh. Amir Solar Powered Motion Sensor Light is a successful upgrade for old versions of similar solar LED lights. The older versions were generally powered with 6-4 LEDs whereas this upgraded version consists of 24 powerful LED bulbs. These 24 super bight LEDs provide brighter and steadier light. These lights are waterproof and are easy to install. They come with 4 different modes of lighting unlike it’s older versions with only a single setting. These four modes are Steady on, Motion sensed bright light with dim light, and Motion sensed bright light with light off and off. These modes make this product versatile. It is bigger, brighter and also saves more. IP65 Waterproof level, makes it perfect for all season outdoor use. Automatic ON at night and automatic off at sunrise. These upgrade d solar powered LED lights are brighter and bigger than the older versions of solar LEDs. They offer easy, stress free installations and are waterproof and hence they are great for outdoor use. The motion sensor is the best in this range as it comes with four different modes unlike single settings in older LED versions. These solar lights are light in weight but have sturdy and durable bodies. They come with a powerful 2200 mAh rechargeable battery which allows it to function for adequate number of hours. This product is also cheaper than other products with similar specifications and offers a good battery lilfe. They serve the purpose of security lights very well as they have excellent motion sensors. The cost of maintenance is almost negligible as this product runs on solar energy. 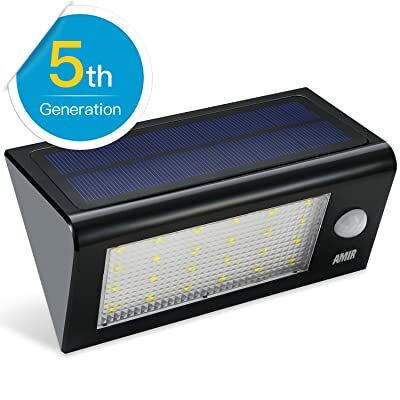 Amir Solar Powered Motion Sensor Light takes more than 8 hours to get fully charged for use, another limitation may be it’s inability to get charged on cloudy and rainy days. 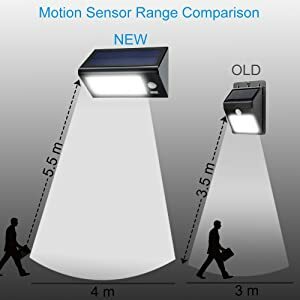 Some users have also mentioned about its inability to detect motion very near to the light due the angulation at which the motion sensor is placed. Almost 80 percent of users have given this product a 5-star rating. The satisfied customers talk about the product being a value for money product. Negligible cost of maintenance makes this product a big hit amongst its users. Most users have mentioned about the fact that these lights are easy to install and durable. Automatic on and off settings rule out the unnecessary wastage of power. These lights can be installed at multiple outdoor locations like yards, patio, deck, garden etc. Almost all of the users are satisfied with this great product. With these lights they are being able to keep trespassers and thieves at bay, also it is a great product for lighting a large garden or yard. Utilisation of power from direct sunlight makes this product eco friendly. From the user reviews it can be clearly seen that this great product is recommended highly.